You should not give more than 10-12 tags/categories to your post. Thanks Vikas for your kind suggestion! I have edited my tags and brought them under 12. Of late I had been reading your guest essays and some time past I got some guideline too from you. As Sri Ramakrishna Paramahamsa has said that ‘as along as we live, so long do we learn’, I am happy to learn many things through my blog. And in the blogosphere good people like you are not wanting to assist others. Thank you Swamiji for the elaborate reply. You like cleanliness (you converted my raw links to clean html links; I am still lazy). I came to this blog while surfing that old post on One Cool Site only; you have a great memory! You have been giving many tags to your posts (removing tags from just one post is not enough) and I think WordPress may have removed you from the tags page. You are still appearing in the tags pages so I think you have not been penalized on this. You can still write to the WordPress support if you want to or just ignore it. P.S. : Buy a domain name Swamiji and you can direct this blog to that link (wordpress will be removed from the domain name then). But fine if you like it like this. Our Respectful Pranam to You! Rishi and I were really inspired by the wonderful talks delivered by Revered Swami Saradaprahbanandaji, Revered Swami Sarvarupanandaji and Revered Swamijee himself. The concert by K Ishwarlall was really wonderful, we were transported to an “Anup Jalota” concert. I just cannot forget how the popular singer Kiran made the audience participation so easily and it was a joy to hear the entire audience singing with him, thus creating a right vibration. We also enjoyed the question and answer session. An excellent and elevating Vedanta Retreat. 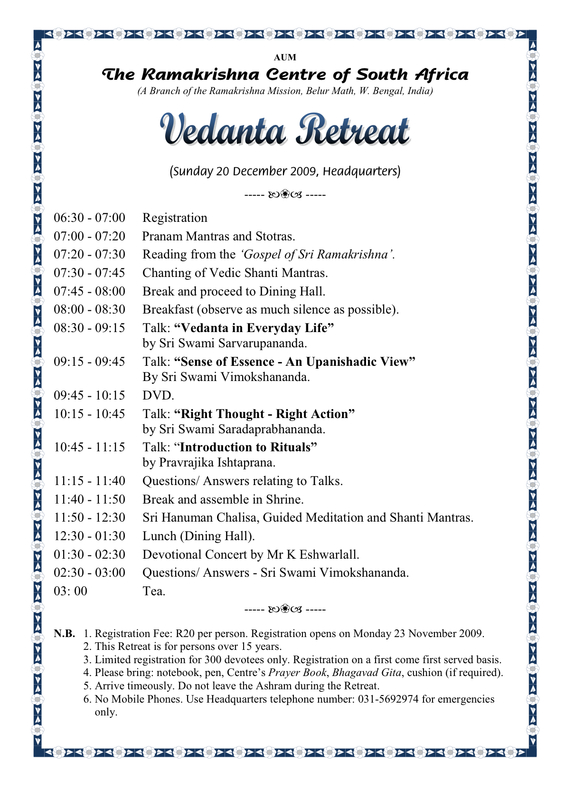 Yes, I am getting tele-response from many devotees that the Vedanta retreat was very useful. May Master help us in getting progress! Please accept our loving Pranam! We echo Urmi and Rishi’s sentiments! The Vedanta Retreat was indeed Inspirational. Mr Eshwarlall’s rendition of the various bhajans and kirtans was really a treat for most of us.